Hunted the grasslands yesterday. Arrived at 10:30 AM and departed the blind about 3 PM with a nice limit of ducks (2 pintail, 4 g-w teal, 1 widgeon). 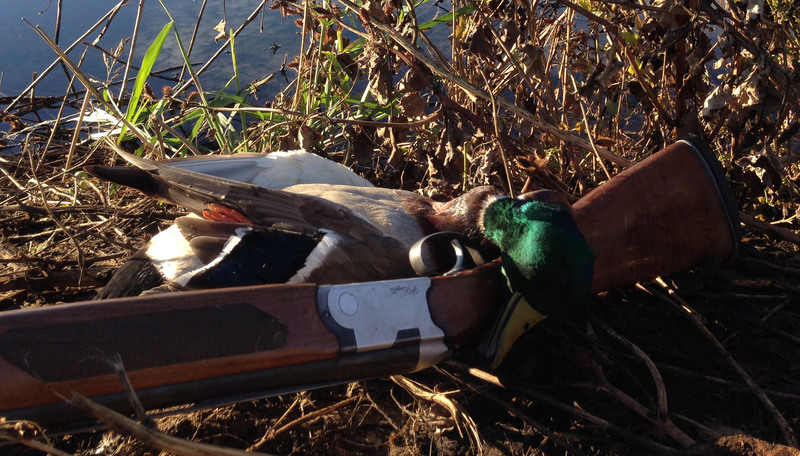 Sprig worked well at midday, but it took while to finish out with greenwings. Although hunting has been consistently pretty good, this was the first time this year that I bagged a seven-bird limit. Sixteen of the twenty hunters that signed out had gone home with limits. The cold snap probably had a lot to do with it and cold temperatures will continue for a while so this is a great opportunity to bag some ducks. I’m hoping to finally get some mallard action in the Delta next weekend. 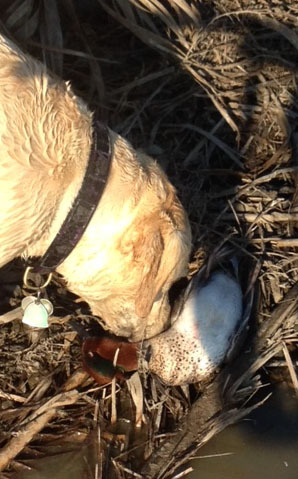 Lola sniffing the last bird of the day, a drake green-wing teal. You never know what Christmas may bring. This year my cousin Wes’ biggest present wasn’t under the tree. 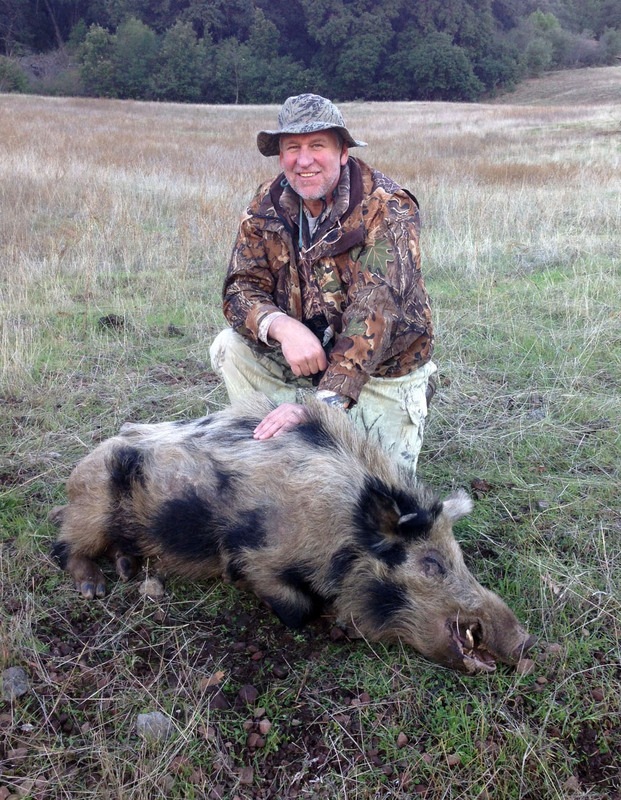 He found it in the form of a wild pig on an open hillside in mid-afternoon at our ranch, south of Livermore. The first shot hit the boar, but it took two shots to put him down – from about 100 yards. He and my brother decided to take a leisurely ride to the ranch to see if they could find a pig. Look what they found. I guessed his weight at about 250 pounds. Rob thought he was bigger. Looking at the photo, it appears he was blind in his right eye. I showed up right after the excitement was over, and I did get a little on me. This boar had left his rooting all over one hillside. Not too many years ago, photos like the one above were common. 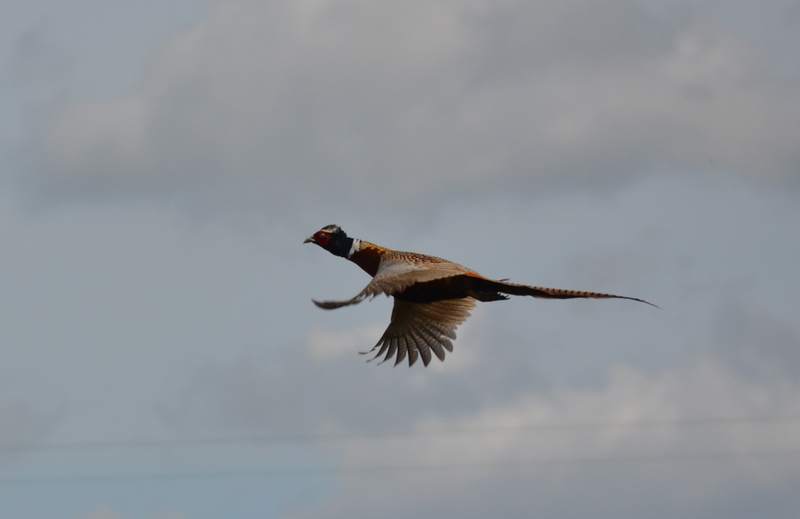 However, good pheasant hunting has been a thing of the past for about ten years now. In the early 1980’s I hunted with a mixed breed hound dog that was deadly on pheasants. One year I personally killed 16 wild roosters on or very near to our 140 acre parcel on Webb Tract. In about 1995, on our Mayberry property, our group bagged 107 roosters on 300 acres. Those were the days. The photo above was taken about five years ago and since about that time, I’ve only bagged a hand full of pheasants. However things definitely took a turn for the better this season. Our little patch on Webb was not planted this past summer and the pheasant population expanded. In fact it expanded enough to where we have had some really good hunts. On my first two trips, I failed to kill a rooster, but I missed four. Lots of close calls. I felt like I was due. On Saturday, Rob and I worked hard to put ourselves in position, but the roosters managed to escape over and over again. Bushed, I retreated to camp to eat a sandwich while Rob continued on. After a rest, Lola and I headed to a sand hill that we’d not yet hunted. As we approached the down wind end of the five acre patch, Lola got hot and took to pursuit of the unseen birds. Her animation told me that they were not far away and I also pursued at my best rate. Lola disappeared into a thick patch of smartweed, fat-hen and aster. When two roosters and a hen shot out of the far end of the patch, I knew where I needed to be and took off at a run (well sort of a run). Half way to the likely spot, another rooster fought his way out of the weeds – in range, but I was on the run. With only one foot on the ground, I took the only shot I had. Luckily the bird dropped. Calling to Lola, I headed to the downed bird. She arrived at the same time as me. The rooster lay spread-eagle on a patch of Bermuda grass. When Lola nosed the tail of the bird it jumped skyward about five feet into the air where Lola snatched it – a great ending to the chase. As best I can recall, this was my first rooster in about three years. Amazingly, between Rob and I, we raised over 25 pheasants on Saturday and more than half of them were roosters. We only got off two shots and bagged one bird. That would have been enough for me, but with an hour left to hunt on Sunday I switched from ducks to pheasants and Lola raised several more roosters. One of them joined the Saturday bird. Now I’m looking forward to some fried pheasant. My favorite way to cook them is to slice the breast meat thin, pound it and then dip it in four before frying. May have to do that tonight. The long pheasant drought is over. 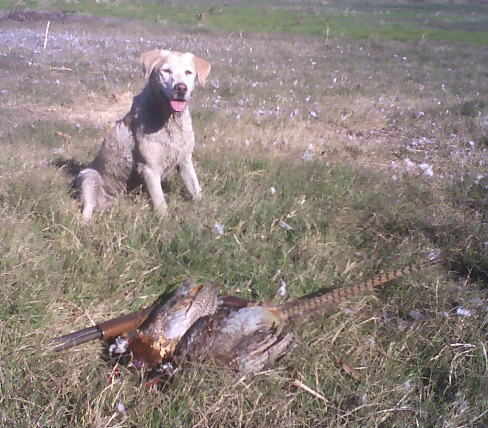 If the trend continues, Lola will be spending more time chasing roosters next fall. Goes to show you that one of the biggest problems with pheasants is farming practice. Left with significant habitat, they can make a comeback. Is the best yet to come? That’s hard to say. I believe the first half of duck season is more predictable than the last half. On the other hand, the second half always has great potential for banner days, but it generally depends upon the weather. 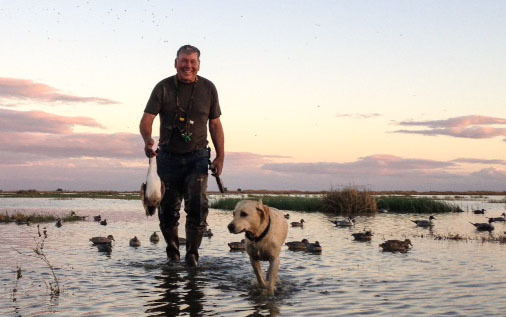 From my view, the grasslands is some of the most reliable duck hunting in California. It doesn’t produce as many mallards as the Sacramento Valley, but it does have plenty of sprig. This year the sprig have been plentiful during the early season. In seven trips to the grasslands, I’ve bagged 25 ducks and 9 have been pintails. That’s over a three bird average and more than one pintail per hunt. That’s not bad. On my delta hunts, of which there have been four, I’ve bagged four ducks of which two have been mallards, one a pintail and the other a wood duck. That’s a one bird average and less than one big duck per hunt. The delta has been disappointing, especially the shut out on opening day. This greenhead came to my mallard call on a delta hunt. However, the remainder of the season lies ahead with some very good potential. Unfortunately, the stormy weather this year has not been all that helpful. Rain without wind is not necessarily good for duck hunting. On the other hand, ground saturated by rain can generate dense fog and fog can produce some very good hunting, especially if the fog is accompanied by cold temperatures. We are set up for that to happen. It appears that pintails have abandoned the grasslands in search of new food sources. This could mean an influx of birds to the delta, a common occurrence as the season wears on and the ducks seek out better feed. We’ve had pretty good luck on pintails at the grasslands this fall. So the rest of the season lies before us and it could be excellent. Or, it could be a bust if the storms keep coming and produce huge areas of flooded ground where the ducks can avoid us. Time will tell. I expect to hunt the delta more often during the second half of the season. Mallards, pintail and white-front geese are in the area. Now we need some good fortune in the way of wind, fog or freezing temps.